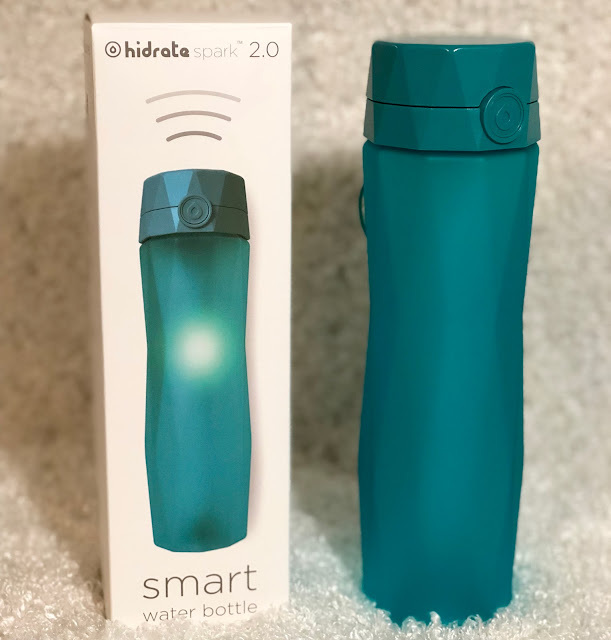 My husband and I have been trying to do better at drinking more water lately so I decided it was time for a little help via the Hidrate smart water bottle. The Hidrate Spark 2.0 holds 24 fl oz (710 ml) and comes in seven eye-catching colors. The bottle is made with BPA-Free Titan plastic and features a drink through pop-top opening that locks shut. This helps prevent breaks and spills, because you want to drink water, not wear it. Each bottle comes with a sensor stick that’s powered by two coin cell batteries (included). That means no charging to worry about! When you drink out of the bottle, the sensor measures how much you drank and transfers this info to the hydration app, which tracks your progress throughout the day, week and month. It only measures as you drink, not when you’re refilling the bottle, or dumping out leftover water. I really like it because it reminds me when I need to get drinking by lighting up. The app calculates a recommended hydration goal based on your personal parameters such as age, height, weight and gender. It can even use your location to determine the temperature, humidity and elevation of your surroundings to make sure your goal is customized specifically to you. You can also manually set your goal if you’d like. And to top it off my hubby can even sync it to his Fitbit which he is super addicted to these days. Father’s Day gift made easy! In September 2014 Nadya pulled together a team of fellow U of M students for the Google Startup weekend in Minneapolis, Minnesota to build the first smart water bottle prototype. In just 54 hours, they built a water bottle that tracked water intake and synced to a mobile app on a smartphone. The product was well received – they won third place and people began asking when the water bottles would be available for purchase. The team worked evenings and weekends for 7 months before being accepted into the Sprint Mobile Health Accelerator Program powered by Techstars. Now the team works between Minneapolis and Chicago, where they are hard at work bringing the product to life, exploring the mountains, and staying hydrated.